You can use another cape if you’d like, but the Cape of the Black Baron is easily farmable by level 85s. There is also the Inherited Cape of the Black Baron heirloom back as well. The hat is from Karazhan but can take some time to farm, but it is my top choice because of the name. 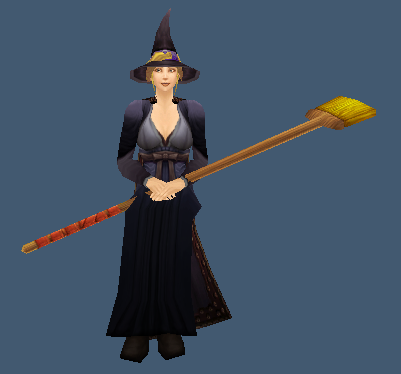 There are some alternative hats that look the same – the Preceptor’s Hat, Dread Mage Hat, Skywitch Hat. This entry was posted in Roleplay Fun & Holidays and tagged costume, halloween, wicked witch. Bookmark the permalink.